15th Ward Councilman Frank Commisso Jr. outside Albany City Hall, May 2017. The paper released Friday was prepared by PFM — Public Financial Management Group, for the New York State Financial Restructuring Board in the interest of outlining potential strategies for the city to close its growing budget deficit. With the Democratic primary looking in September, Commisso zeroed in on some key recommendations made in the report. "Two of those are really concerning to me. To raise property taxes and to expand the trash collection fee to all households in the city. These are unacceptable recommendations. We already know that by raising the cost to homeowners and businesses here in Albany we will get more of what we already have. We have vacant buildings throughout West Hill, Arbor Hill and the South End behind me. We are already paying developers to build on the periphery of our city and in the center of our city... we're paying significant dollars, many millions, to develop in the city of Albany. So to have a city where we have already depressed neighborhoods and we have, ah, we're in a position where we need to pay developers to come in and build new structures, to say that we need to charge more taxes, have more fees, is something that's unacceptable to me." City Treasurer Darius Shahinfar stood above in a city hall doorway, shaking his head, later explaining: "The city does not give away money for economic development in the City of Albany. It provides tax abatements for developers coming through the IDA. And those tax abatements are also available for homeowners and for small businesses in the city through seperate city programs. They do not have to go through the IDA to achieve those." Commisso says he has developed a plan that embraces several of the recommendations in the PFM report. Albany Mayor Kathy Sheehan listens to a reporter's question in a sit-down with the media at City Hall, May 2017. 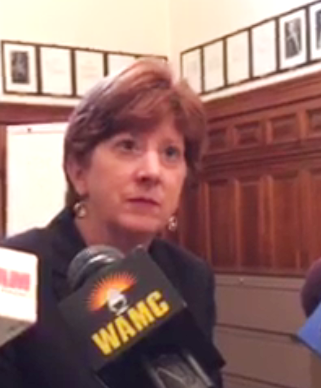 Within the hour, first-term incumbent Mayor Kathy Sheehan held a presser of her own inside City Hall, once again emphasizing that annual budget shortfall. "This report demonstrates that there is, ah, there are significant challenges for the City of Albany because of the fact that we don't get our fair share of aid. And we received $12.5 of new aid based on the information in this report. And there is certainly more work for us to continue to do. We finished 2016, we don't have our audited financials yet but we finished very strong for 2016, because we've implemented many of the recommendations that are in this report and we have a pathway to implementing further recommendations." Sheehan affirmed she is not looking to raise taxes, as the report suggests. But she is open to the possibility of awarding sponsorships for cultural affairs, such as the Tulip Festival and Alive At Five. The paper recommends trimming the police force by 15 officers. Sheehan says given the terror attack in Manchester, England, this is not the time to risk cutting back the department. Common Council President Carolyn McLaughlin, also running for mayor, commented on the report on NewsChannel 13: "There are a number of suggestions that we have got to educate the community on. Educate the business community. Educate the non-profit community. Everybody's going to be affected one way or another." A second Albany mayoral candidate has released personal income tax returns.